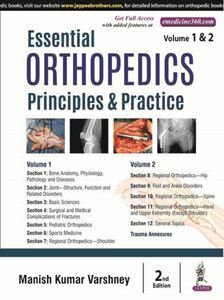 The textbook elucidates in detail most basic definitions and concepts describing the recent advancements in the understanding and management of elective orthopedic conditions. Primer for orthopedic trauma has also been included in 2nd edition as annexures that describes nearly all of the commonly encountered fractures. Students would benefit by the lucid text that covers most of the questions asked in the postgraduate theoretical examination papers which are otherwise difficult to find in currently available books on the subject. Difficult and advanced concepts are mentioned in points so that students have a fair idea of such modalities and concepts, but are not overburdened by their details that are unnecessary for postgraduate orthopedic trainees and are of use to specialized practice only. Attempt has been made to dwell in detail the basic science in orthopedics that is often missing from dedicated texts. Further these concepts are deliberated in sections divided in body regions so that correlation could be established. Nearly all the concepts are described by relevant and beautiful illustrations (more than 2200) so that the concept can be quickly grasped and remembered for long. Manish Kumar Varshney MS (AIIMS) DNB (Orth) MNAMS MRCS (Glasgow) is a Consultant Orthopedic Surgeon working with Narayana Group currently at Shri Mata Vaishnodevi Narayana Superspecialty Hospital, Katra, Reasi, Jammu and Kashmir, with more than 13 years' experience in the field. He has been trained in the field in one of the best institutes in the country and has assimilated the teachings in the form of small compendium "Practical Orthopedic Examination Made Easy" that had been one of the most read-out texts in orthopedics in the country and admired by postgraduate students in orthopedics. He has been forerunner in guiding the postgraduate students for their thesis, grasping the principles of orthopedics and rendering utmost help in examinations, wherever he has worked and even far away. He has been a faculty in teaching courses organized by "Association for Osteosynthesis (AO)" foundation to help students understand and grasp the principles of trauma surgery. He is an avid researcher and always supported in deciphering correct, true and scientific knowledge. To this end, he has more than 40 national and international research publications. He is a reviewer for many national and international journals. He has presented many research works in national and international conferences and chaired sessions in regional conferences and postgraduate teaching sessions. He is also a local examiner for National Board of Examinations (NBE), New Delhi, India. His research work has been acclaimed internationally, and he received the prestigious "Paul R Manske Award" [conferred by American Society for Surgery of the Hand (ASSH)] for best paper in congenital deficiencies of upper extremity in the year 2013. He also received the "SS Yadav Gold Medal" for his research in aneurysmal bone cysts that has been cited by many authors doing research in the field.